Pasek during her visit to Barro Colorado Island and surrounding peninsulas in November 2004. Yostin Lissette "Justine" Pasek Patiño (born August 29, 1979 in Kharkov) is a Polish-Panamanian model, FAO Goodwill Ambassador and beauty queen who was 1st runner up at Miss Universe 2002 and consequently Miss Universe 2002 when the winner was dethroned. Pasek was born in Kharkiv, the daughter of a Panamanian homemaker and Polish engineer. Affectionately called by her Polish name, "Justyna", she lived in Ukraine for a year, but spent most of her childhood in the village of Wożuczyn near Zamość, Poland. After her mother finished her studies in chemistry, the family moved to Panama. 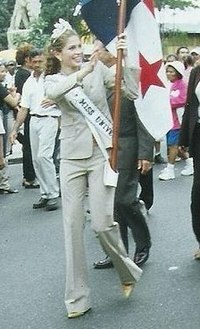 Pasek's start in the modelling world took place when she joined the "Chica Modelo" (a model search) contest in 1996 where she won the award for Best Editorial Model. It also gave her the chance to work for Physical Modelos, her official modeling agency as of today. As a model Pasek has taken part in calendars, commercials, and as a stewardess in different events. ^ "Justine Pasek". Abilitymagazine.com. Retrieved 2012-09-09. ^ "Viva Panama Organization". Vivapanama.org. Archived from the original on 2009-05-01. Retrieved 2012-09-09. ^ "Justine Pasek". Panama-guide.com. Retrieved 2012-09-09. ^ "Justine Pasek". Globalhealth.org. Archived from the original on 2011-09-30. Retrieved 2012-09-09. ^ "Food and Agriculture Organization of the United Nations". Fao.org. Archived from the original on 2012-09-18. Retrieved 2012-09-09. ^ "Justine Pasek". Missdatabase.blogspot.com. Retrieved 2012-09-09. This page is based on the Wikipedia article Justine Pasek; it is used under the Creative Commons Attribution-ShareAlike 3.0 Unported License (CC-BY-SA). You may redistribute it, verbatim or modified, providing that you comply with the terms of the CC-BY-SA.